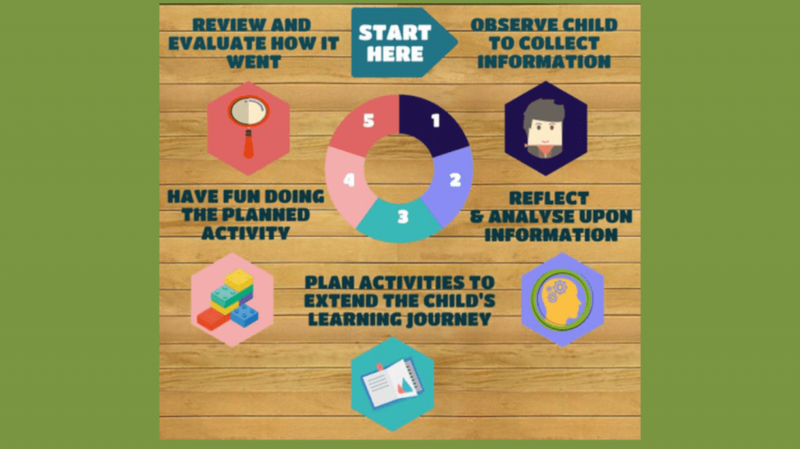 How to write child observations, reflect and forward plan. 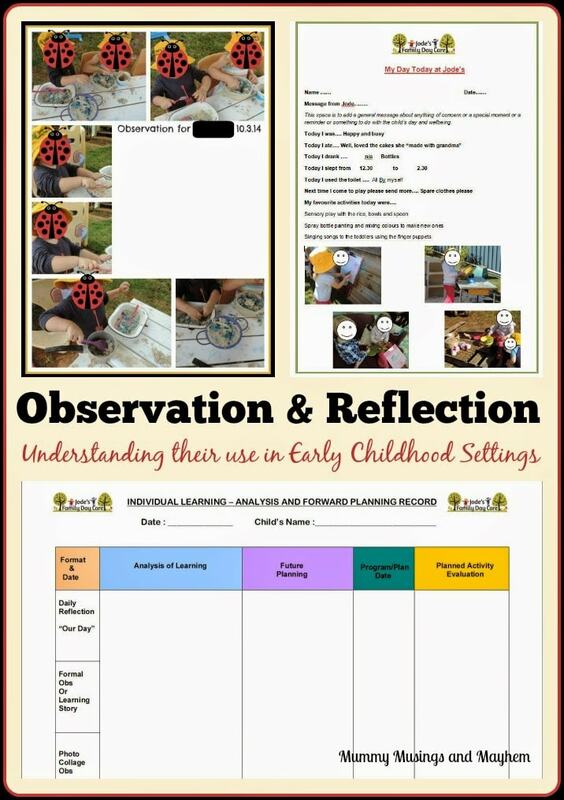 Understanding Observations, Reflection and Linking in Early Childhood Settings. I still remember learning about child observations when I was studying my Diploma over 25 years ago now. The best piece of advice I was given was to find what works best for me because that will probably be what then works best for the children in my care. 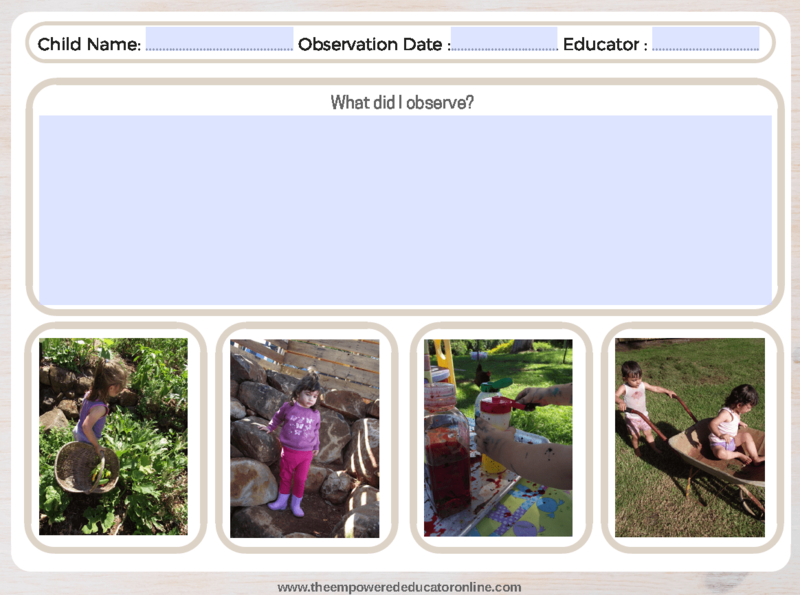 In Australia we now work with the EYLF learning outcomes but this has not changed the reason why we do observations – it’s just a matter of finding the style that suits you best! Simple right? I hear you snorting derisively but stick with me, observing and reflecting doesn’t need to be a difficult process and I’m going to try and demystify it a little and help you to find what also works best for you with the minimum of stress. We can do this together I promise! 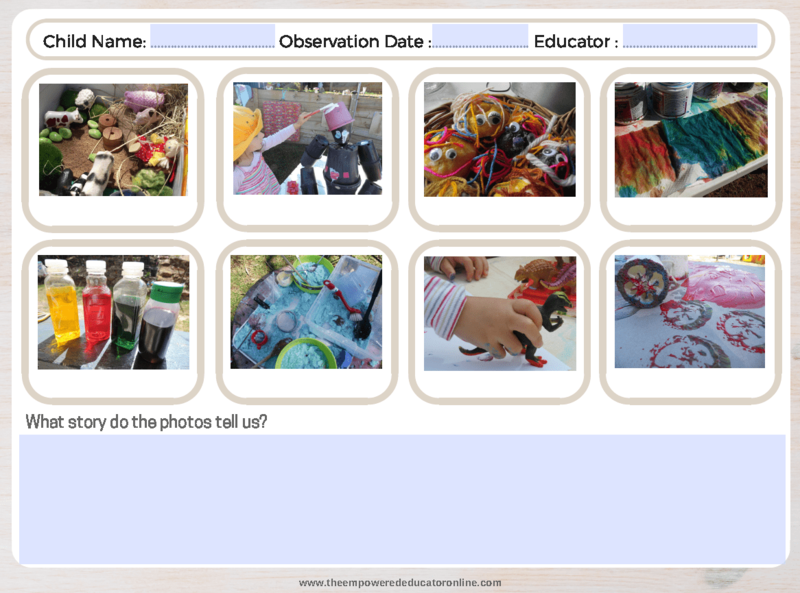 But first let’s explore what observations are and why we need to do them when working as an early childhood educator. If you would like to download a print friendly PDF Factsheet of this blog post for future reflection and guidance just click on the box below! What are Observations & why do we do them? Such a simple term but when using this term in early childhood settings it can become a little confusing as to what is really expected when we talk about ‘observing children’. Observing is obviously the act of looking and watching but in our profession we need to take that one step further. It also encompasses the skills of listening, questioning, reflecting and documenting what we actually see and then interpreting succinctly in order to identify and support a child’s strengths, needs, interests and development. When writing observations keep in mind that you cannot know exactly what a child is feeling so you should be writing or noting what you see and hear…not how you think he/she is feeling. Be factual, it might help to remember the two words below as I go into further detail about observation styles. Objective — writing what we see and hear. Let’s break that down….or in training speak ‘unpack it’! You are basically gathering information about a child to inform your programming and ensure you are planning appropriate activities, strategies and experiences for each individual child and also the whole group. You are aiming to foster their development. 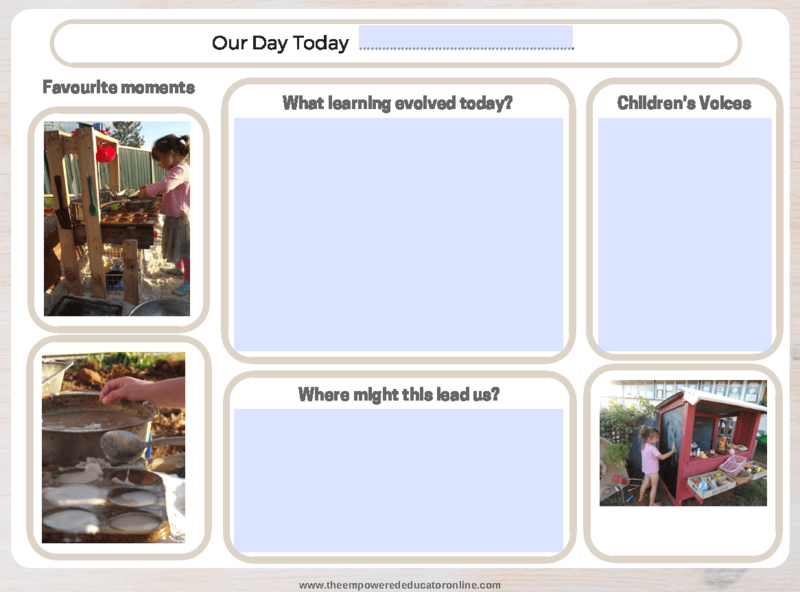 First watch and observe….look for significant moments…not just moments to meet this week’s observation quota – that is a waste of your time and does nothing to extend a child’s learning journey. It needs to be authentic to be useful as an observation. Record what you see and what you hear using the format/template/style that suits the situation, the time you have to observe, but also your particular skill and comfort level. Incorporate visual or audio tools into your observation if you are comfortable doing so and it helps to build your overall picture or story. So we OBSERVE, RECORD, REFLECT & INTERPRET then use all of that to PLAN our PROGRAM. 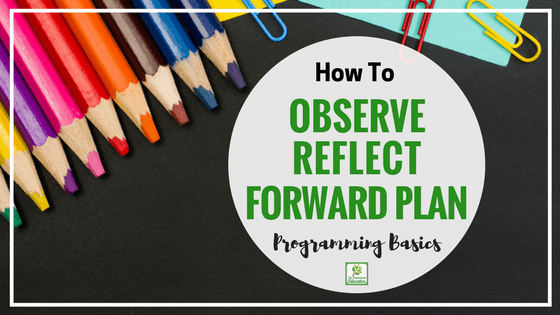 When you add an activity/environment or experience to your plan that has evolved from an observation you make a note of that in your programming(more on how to do that below) and you have then ‘linked’. Told you it was simple! But now I hear you saying “But what about the EYLF outcomes?” It tells us we need to do observations in a certain way and I don’t understand it, it’s too much work”. Going to stop you right there and gently prod you toward re reading your Early Years Learning Framework because there is a lot of incorrect information out there regarding what you need to do to meet the new requirements. I’m going to bust a few myths for you right now….although as always keep in mind that this blog is purely my own interpretation and reflection based on my own reading of the document and service practice. If you trained before the EYLF came into being then you can still draw upon the knowledge and experience you already have, you don’t have to ‘relearn’ everything and do the same as everyone else. What you do need to do is just incorporate some of the language of the EYLF and it’s important outcomes. You will find if you read them closely that many are the same as the things you learnt years ago, there is just a slightly different focus with how to approach learning and the language that is used. You do not need to use numbers, colours or confusing codes to link your programmng and documentation to eylf outcomes, quality areas, standards or elements. You do not need to link your activities to the EYLF! What you need to ensure is that you have an understanding of the 5 outcomes and the activities that fall under the different categories….many will cross over so don’t feel you need to make them fit in one box. Your planned individual and group activities should clearly show that you are meeting all areas of the EYLF. This might be seen in your planned activities, your spontaneous child led activities, your environment, your resources, your intentional teaching moments, your language and communication with the children,your program template/method, how often you follow and build upon a child’s interests and there will be a clear link to a child’s ongoing learning journey (or “distance travelled”)through their individual records. Let me just repeat again for those that think I might be losing it….there is no need to link each and every one of your activities and experiences to an outcome area…it should already be clear! Your planning doesn’t just need to be child-initiated. Planning learning experiences based on children’s interests and strengths is important but so is using some planned opportunities for intentional teaching. I use a combination of both in my programming, some weeks there may be more focus on intentional teaching, other weeks more focus on children’s interests or individual focus activities. What I’m trying to say is that although the eylf does place a level of importance on experiences being child initiated it is still best practice to incorporate a combination of planning methods. The idea is that you are continually documenting their learning journey but also increasing their content knowledge. 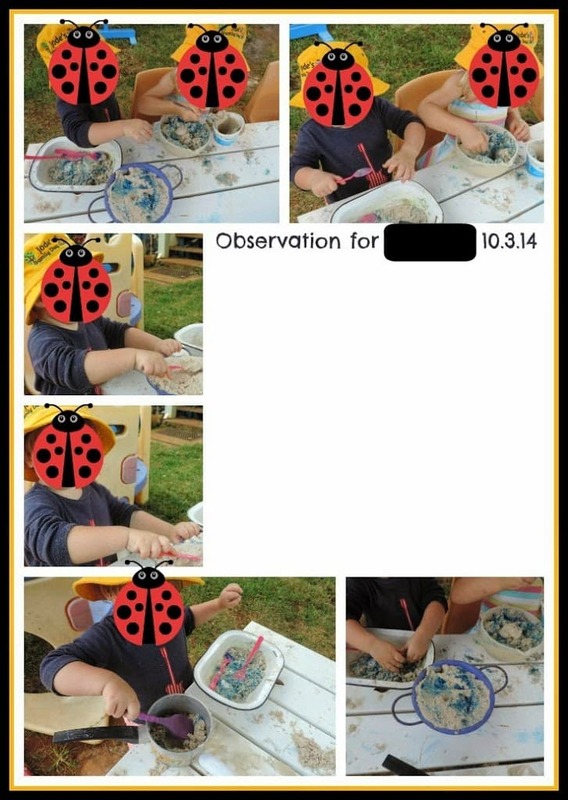 The EYLF and NQS do not tell you how many observations you need to be doing. This will depend upon the number of children in your care, the environment you work in, your centre or scheme expectations. You do need to show an ongoing method of collecting and evaluating observations and then using the information to inform your program. But there is no set magical number for compliance. Try and think about telling the child’s story though and how often you might need to be adding observations and reflections to keep the story rolling along without big gaps!! An observation here and there is again a waste of your time and does nothing to support the child on their learning journey. Observations DO NOT need to be linked to theorists or quotes from theories. When I first heard “the eylf says we have to” floating around I don’t mind telling you I said a few choice words…no way was I doing that…who has the time? So I went back and read the document again and what I noted was that you need to be aware of and understand the different perspectives, theories and theorists as they should inform your practice in different ways as you continually reflect on your service (exactly how I was first taught 20 years ago so nothing different there I promise 😉 ) But no need to cross reference with your observations…unless you are some sort of over achiever I guess…which I am but I’m also realistic (and I have twins). You don’t need to outcome number everything people…stop it, stop it now, you are stressing out about it way to much judging by the questions I am getting….‘documentation demonstrating that the five learning outcomes are evident in documentation of children’s learning’ (Element 1.1.1) This does not say ‘put an outcome number next to your observation so we can see a clear link to that outcome now being achieved’. YOU need to know what area the focus is on but please think about it in terms of a journey rather than one activity or observation ticking a box. You should be demonstrating a child’s progress through your documentation which then reflects the learning outcomes rather than worrying about what numbers you need to add to prove you are analysing the collected information correctly. 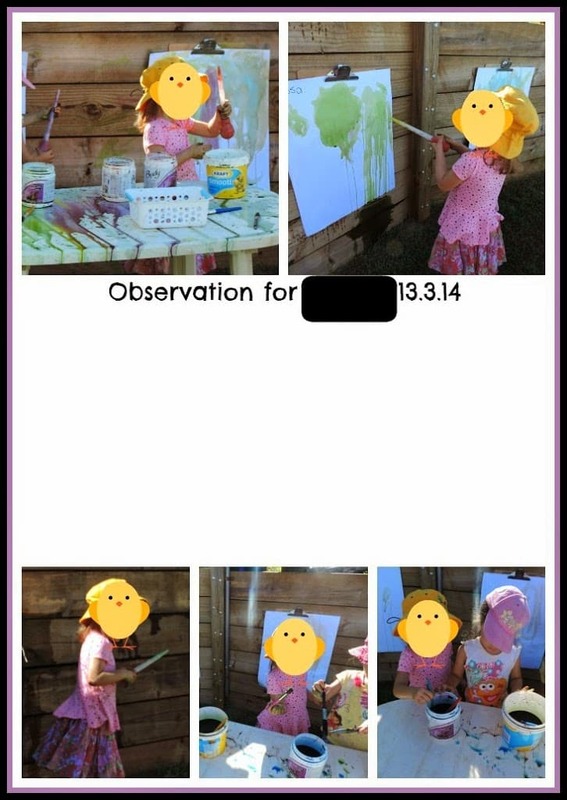 The EYLF does not tell you which method of observing and documenting you must do. There are many types of observation styles and all have something to offer when used in the right context. You will find you get the most useful results from exercising your judgement and the method that you understand the best and also suits the children you have in your care. You don’t just need to do learning stories or anecdotal obs or checklists. 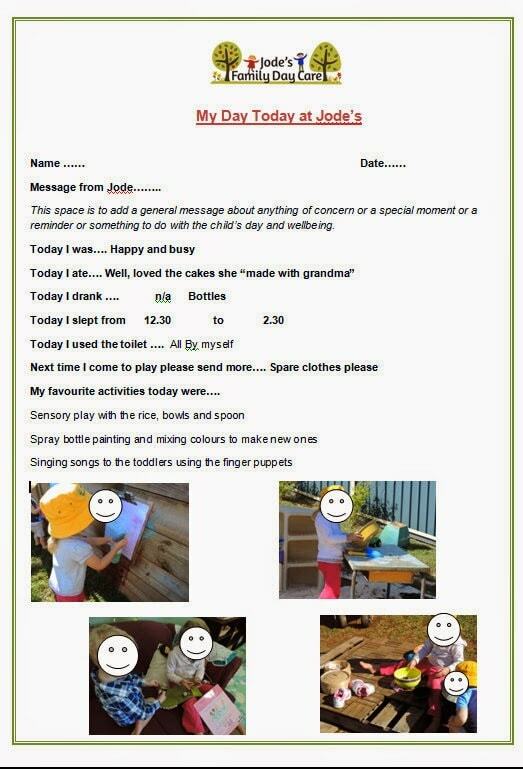 You can use a little of everything to capture the children’s learning…just make sure it is significant! If you tell a story make sure it is adding to a child’s journey not just stating the obvious. What Observation Style suits me best? Before you try to answer that keep in mind that you don’t need to just settle on using one format….remember you can combine a few different methods or you can just stick with one until you are confident with that approach. It really is about your ‘system’ as a whole. 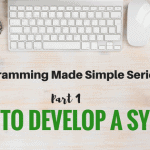 Yes I know I keep saying that in all these programming posts but that should be telling you something! If you do not approach your observing and programming systematically it becomes easy to miss parts of the cycle or certain children and that is when it becomes easy to get overwhelmed or frustrated. Let’s explore a few of the more popular formats…there are more but these are the ones I am most familiar with and have used over the years so that’s what you are getting! The key is to try a variety of styles to build a picture of the child, a group of children and whole of service to inform and support your planning. Running records are quite detailed and often take quite a bit of time to complete. They are written as the activity or event is occurring and are usually quite descriptive. You write a running record in the present tense so that means writing exactly what the child is doing or saying. They obviously need to be written while you are there observing the moment so this can take you away from other children and your participation in the activities and play occurring. I personally have not used a running record in many years mainly because they are so time consuming. They are however particularly useful when you want to focus on language development or have suspicions about risk of harm as the child’s voice and exact actions are very important in these situations. Anecdotal records are similar to running records except they are written in the past tense. Anecdotes describe what happened in a factual, objective manner, telling how it happened, when and where it happened, and what was said and done. You can therefore write these observations up after the event occurred making them a little more user friendly for busy educators. You might like to jot a few notes in your diary or on a sticky note or two to give you little prompts for later when you are able to sit down to write up the observation. I use this type of observation when I want to record a little more detail about a significant learning event. I usually also like to include a few photos to add to the text. When using this format I try to use the language and context of the EYLF so that correlations can easily be made to the outcomes. In previous training (or the ‘olden days’ ) we were taught to focus more on the developmental learning or achievments taking place, I still focus on this but I also incorporate elements of the EYLF and identifying current strengths. It’s really not hard, just a shift in thinking and language. 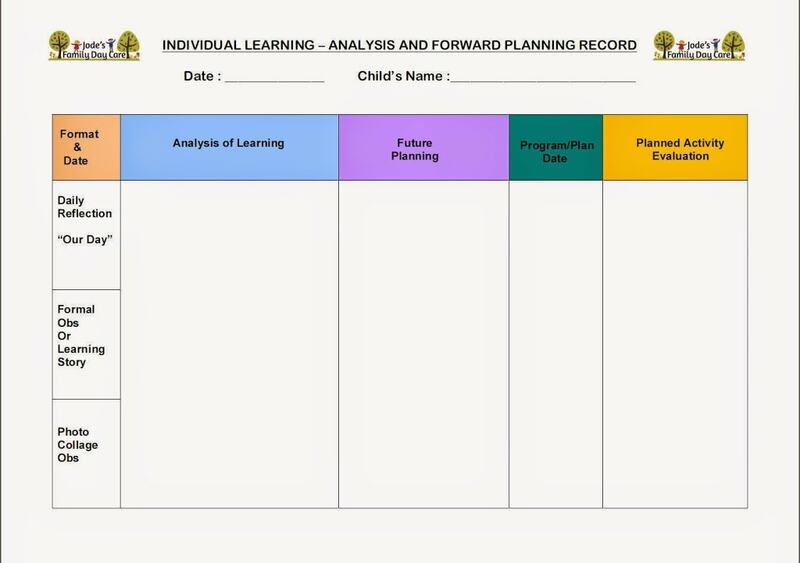 This is the format I currently use for recording anecdotal records for individual children. I file them in the children’s computer folder portfolio. First let me say I am not a huge fan of learning stories but I know many are and they do play a valuable role in many programs so I thought I should give them a mention. 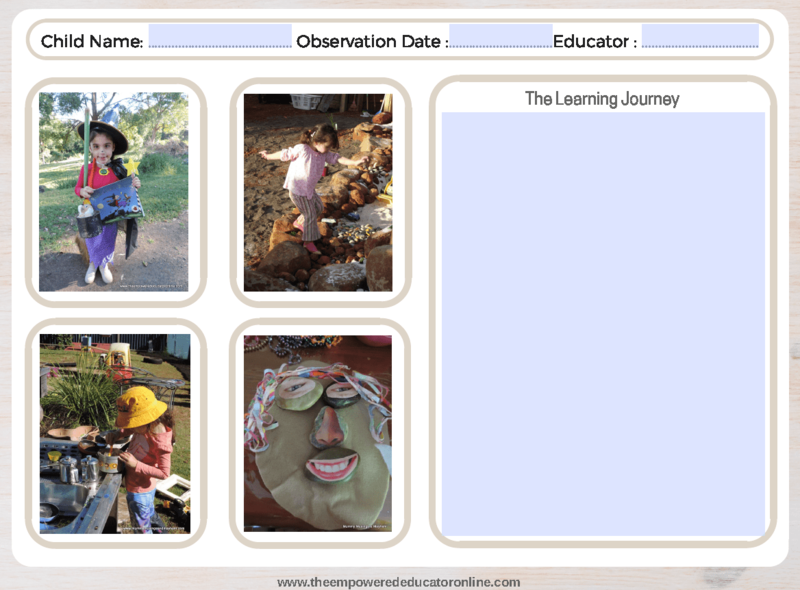 Learning stories involve educators detailing the general learning of the child which is occurring in an observation but it is presented in a more creative way, often accompanied my photos to provide further evidence of a child’s learning. They are usually also a little easier for parents to understand as they aren’t too technical but they do take more time to read and time poor parents often prefer more visual examples of their child’s progress (in my experience). When writing a learning story you don’t need to worry about using subjective terms or including your own interpretations when writing about the child’s actions which is why many educators like them.You can write in a storyteller (narrative) format to capture the meaningful elements you are observing within the learning process before you. Learning stories usually focus on what the children can do rather than what they can’t whereas the running record and anecdotal records often focus on identifying gaps in development (which they actually don’t need to, it has just been the traditional way in years past). The idea is that you are recognising and describing the learning you see and writing about it in a story type format. If you want more information about how to write learning stories this article explains the process in an easy to understand format. I will just say that if you choose to use learning stories then you should be aware of not spending too much time writing a lovely story but at the end not really have anything concrete to work with. I have seen some wonderful stories but struggle to understand the reason behind them or how they can be used to further support the ongoing journey of learning for the child. Just something to consider as they can be very time consuming. Some people love to do them though – it’s all about finding your own style! This is pretty self explanatory but don’t underestimate the power of photos or audio snippets of the child’s voice! Many people now like to compile a collage of photos relating to a specific experience or activity accompanied by short blocks of text further detailing the learning or journey taking place. You can make them simple with few words therefore allowing the photos to tell the story or you can add more text if you see the need to tell the story in more detail.This format also makes it easy to include ‘the children’s voice’ which immediately sets the context of learning. I like this method because I can take photos of significant moments as we play, no need for notes and clipboards! Here’s a few examples of how I do mine…..obviously I write text in the blank spaces. Sometimes I fill a space, sometimes I just add some brief dot points and let the photos tell the story. I know many people also use apps on their phones or programs on their computer which can be very helpful for those who embrace these methods and find they save time. I prefer to make my own templates and use photo programs such as picmonkey.com to put together the collages. You can just insert some photos into a word document though, add a little text and it will be just as useful! Another thing I love about using photos is that they are an instant record but I don’t need to put them together into a document until I have the time to do so. The photos act as a prompt and sometimes I don’t get to them until a week or so later but I immediately remember the significant moment I wanted to record when I see the photos. I like to send the majority of the children’s craft and artwork home as it is important to them and to me that they share their hard work and tell the story of their learning to their family at the time it happens. But with their permission and involvement I often put together some visual displays so they can share their journey with friends and family within the care environment. Parents really enjoy spending some time looking through the displays and making the connections to learning. Just because I send the majority of artwork home doesn’t mean I don’t keep a record of it and the process and learning that was involved! Again, photos are a valuable resource here and I often compile photos of the children’s work and accompany with some very brief anecdotal text of what was happening or even just the children’s voices which goes toward displaying the children’s progress as they travel the path of their learning journey. The samples might be individual or group projects. I then save these in the children’s computer portfolio folder as well as my own children’s files. You can use your daily reflections and journal jottings to provide observational evidence. You don’t need reams of paper to tell a story. I often refer to my ‘our day’ forms in my forward planning and it comes together over time to tell a story. I also use the weekly reflections on my program which I complete at the end of each week (obviously) 😉 As I said in my previous post, there is no reason why one document or form can’t meet a number of goals and therefore make your job a little easier. 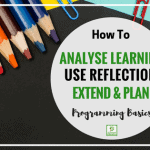 Everyone will reflect in different ways and it would take to long to go into detail here but just know that you can use these reflections to form part of your evaluation and ongoing planning. I’ll be following up with a post about reflective practice soon. 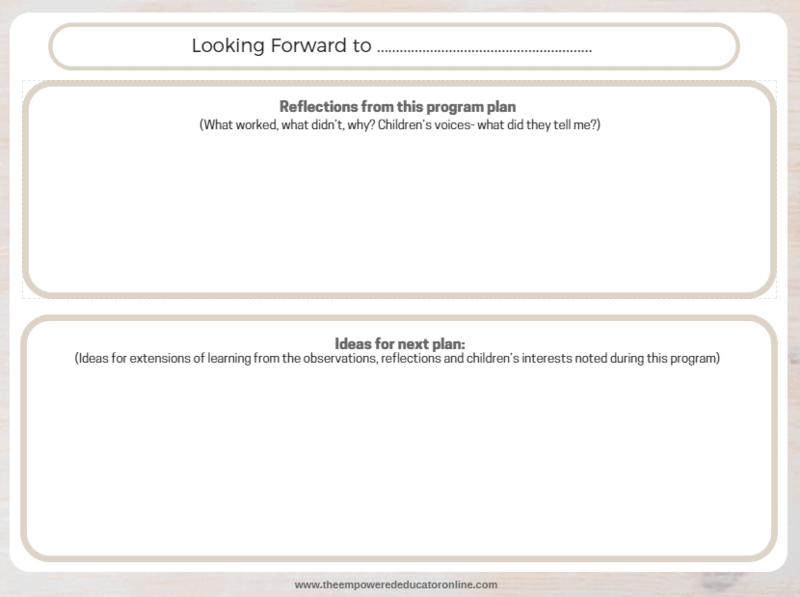 If you are looking for some simple templates like this to use you will find the editable PDF versions of the ones above and much more in my Essential Templates Toolkit for educators HERE. This way you can include the milestones you want to check or observe and also include a space for a brief comment…this allows you to put the abilities or deficits of learning into context. You would also add the date each particular milestone or goal was met. Checklists aren’t as popular as an observation tool as they used to be but I still believe they have their place and can easily be modified to embrace the elements of the EYLF. There is no reason why you can’t use checklists to identify both strengths and weaknesses and use them to form part of your evaluation of a child’s learning. My advice if using checklists though is to not just rely on ticking and crossing off milestones…you want to add some details so that you get a clear picture of the learning or struggle that is taking place. Just something brief, a line or two. This is how you can then use checklists to document the progress of a child’s journey and help inform your future planning and therefore incorporate elements of the EYLF at the same time. Reflections/Interpretation – What Does It Mean? This is a question I have been asked a lot in the last few weeks. This blog post is already too long (again!) but I am going to try and explain quickly as it really shouldn’t be a difficult process for a trained educator. Perhaps it will help though to put it into simple terms. You’ve written an observation and gee it’s good….but what does it mean and what purpose does it offer? To ensure you didn’t just waste your time you now need to reflect upon and evaluate your observation. Now you get to use your ninja early childhood skills (hmm, bit tired sorry) but you do! Read over the observation, look at the photos, try to recall the moment as often you will not be completing your evaluation at the same time…well I rarely do as I like to break up things into blocks, you might be different. Either way, now you want to write down what is taking place. Consider asking yourself what is happening, why, when and how? Evaluating children’s observations allows us to identify the children’s strengths, interests and opportunities for further development. Interpreting an observation is not just writing a summary of a child’s development, you are interpreting developmental skills, capabilities, potential, emerging interests and preferences. This is how you will then be able to plan future appropriate experiences, activities and environments. When interpreting and evaluating a child’s learning and capabilities consider not only talking about the child’s development in the traditional main areas (i.e social, emotional, physical, cognitive etc) that were demonstrated but also using the Early Years Learning Framework. I believe both can play an important role in today’s evaluations and provide a more holistic picture of the child. So you understand how to talk about the developmental learning taking place but not how to incorporate the framework principles as well? You could list the outcome numbers if you want, I know that many do but often a child’s demonstrated learning can overlap into a number of areas so I find it easier to just ‘use your words’ (yep, a little educator humour there…stick with me). What I mean by that is finding the outcomes you feel correspond to the learning that you observed and write about it in that context without having to actually list the numbers and make it to formal. Did you recognise the two framework outcomes the above phrases refer to? Let me know in the comments below! So you look at the outcomes and decide what might be important to note in your interpretation, then include some of that wording. I also try to include the language in my reflections and parent communication forms too if possible. Interpreting just the important or significant events within an observation does take a little practice and at first you might find you write a fair bit so that it is clear in your mind and you might try to include everything you think is important. Over time though you will come to recognise the significant learning as you are observing instead of after and only need to add a short summary to outline the child’s learning and abilities. It is important to remember that you are not rewriting the observation to tell a story but are just trying to highlight the area of skill or need that the child has demonstrated. You need to interpret then summarise the skills, development and behaviours which are included in the observations you have taken. There should be a direct link…not flowery wording of what you think *might* be important to add. 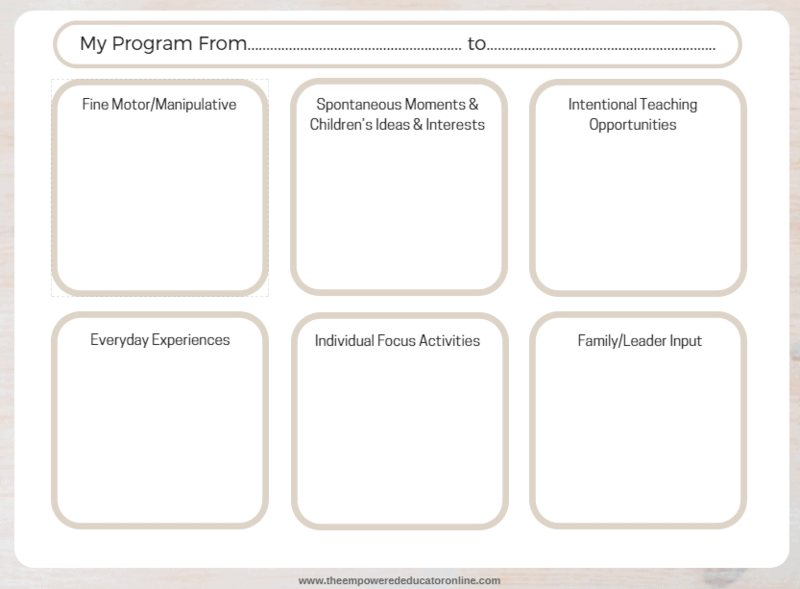 This will then form a valuable part of your programming cycle or system and help your future planning for the child or group. We then move to the final step in the observation/planning cycle and here you will tie it all together! When you have evaluated your observation and confirmed where the child’s progress is, you can then think of their next steps. You don’t need to feel you have to write reams of next steps; if it is a short observation you may just add 1 activity or experience in your forward planning. If it was a detailed observation you might add a number of activities to do over a few weeks. So let’s bring it home (I am meant to be bathing children and cooking dinner right now although even this is more interesting than that I admit). The final frontier…..forward planning and linking this to your programming! Forward Planning & Linking Effectively. I know a lot of people struggle with this part but I actually find it the easiest part of the cycle so hopefully I can help. With your interpretation and summary complete, you can now think about which skills, capabilities, potential, interests and preferences you wish to focus your attention on for the sake of program planning. 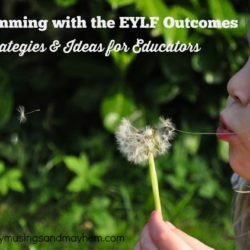 You can also look at a deeper level, linking the learning the child has completed in the documented observation to the EYLF which should be guiding your program planning. When using your interpretations and summaries to devise experiences, activities and environments which will foster the child’s development, be sure to look closely at the skills the child is already showing and then plan for an activity, experience or environment which would further develop the demonstrated skills. Make sure you are offering different experiences in your forward planning, not just a extended version of the activity you observed previously. You need to plan from your interpretation and summary not just the observation. This will ensure that the child, the group and you as an educator are not getting bored, that the experiences you continue to provide are varied and foster different skills. Planning is more than just the next activity on a program. 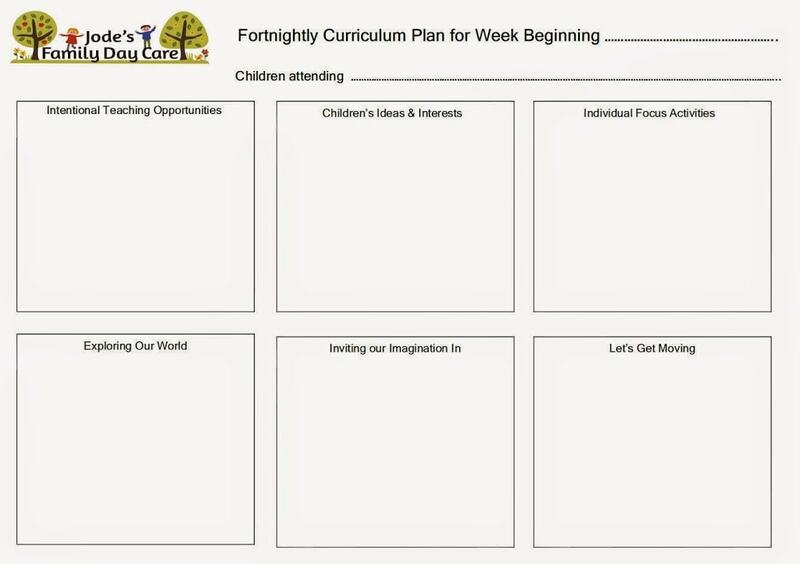 Your future planning should be looking at resources, materials, people, routines, expectations and strategies .Try to think outside the box a little and also how you could incorporate the activities into group learning experiences and not just individual focus activities. When you have listed the activities you want to plan, you then need to find a way to make sure you are linking that activity back to your original observation so that you can come back and reflect upon how the planned activity went. Did it meet expectations, challenge the child etc? This is where a lot of people use initials, dots, colours, symbols etc as well. Personally they all do my head in so I added an area to my program where I add ‘focus children activities’ with the corresponding observation date. I then come back to my forward planning form when the activity is completed and write a brief summary of how the experience went and date when it occurred. If I have forgotten when that was I just look back at my ‘our day’ reflection forms from the week. It’s hard to explain so I am going to finish this novel by showing you my observation/forward planning cycle. But I developed this system because it suits my style and works efficiently as a system for me…it might not for you but you might be able to take something away from seeing it in action. If symbols etc work best for you then stick with it! 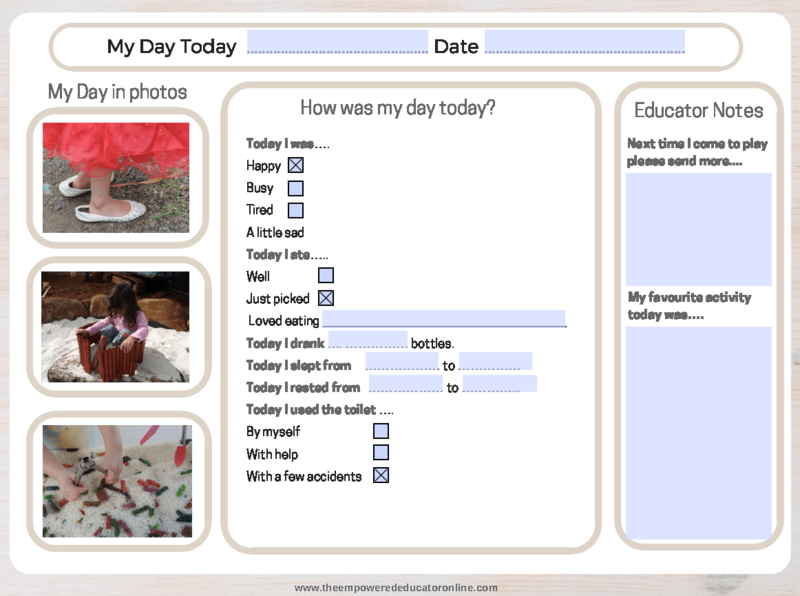 I also use my individual “My Day” communication sheets as well as my group “Our Day” daily reflections record which are emailed to parents at the end of the day and also filed in the children’s digital portfolio folders on the computer. 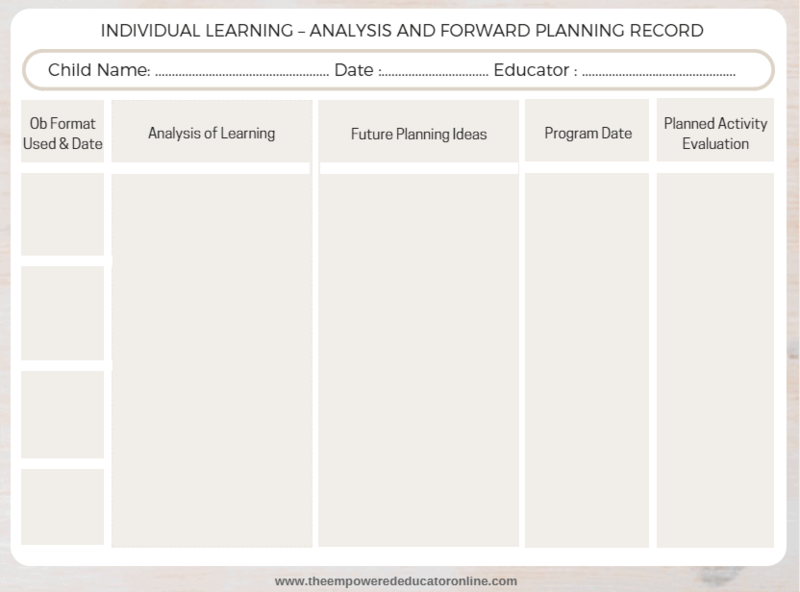 I now use my individual analysis and forward planning record form to begin the process of interpretation, forward planning and evaluation. You can see on the form that I have listed the above observation styles down the left side so when I come to use the form I just tick which method I used and add the date. When the activities are completed I come back to this form and write the date activity was observed and a brief evaluation of how the activity proceeded…not a story just a few notes, no need to go overboard, it’s really just logging another stepping stone in the child’s ongoing journey. 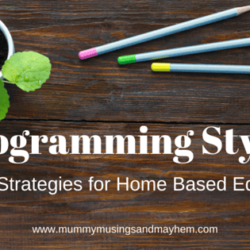 I am always updating and tweaking my weekly programming to suit my needs and the children currently in care (There is no rule that says you have to stick with the one style or template!). Please keep in mind I am sharing the system that works for me, it might not for you but I do hope there is something here that you might be able to take away that makes your life a little easier when it comes to working out your own planning cycle. There are many more ways that I haven’t covered but there is only so much writing a gal can do on her weekend! Want to download a free print friendly version of this article for further reflection and support? Click the image below to have a PDF factsheet sent to your inbox for printing! Finally, when considering your observation and reflection techniques perhaps ask yourself these 2 questions…. 2. How am I using this information to extend and enrich learning for each child? Want to connect with other passionate people who love working and playing with children? 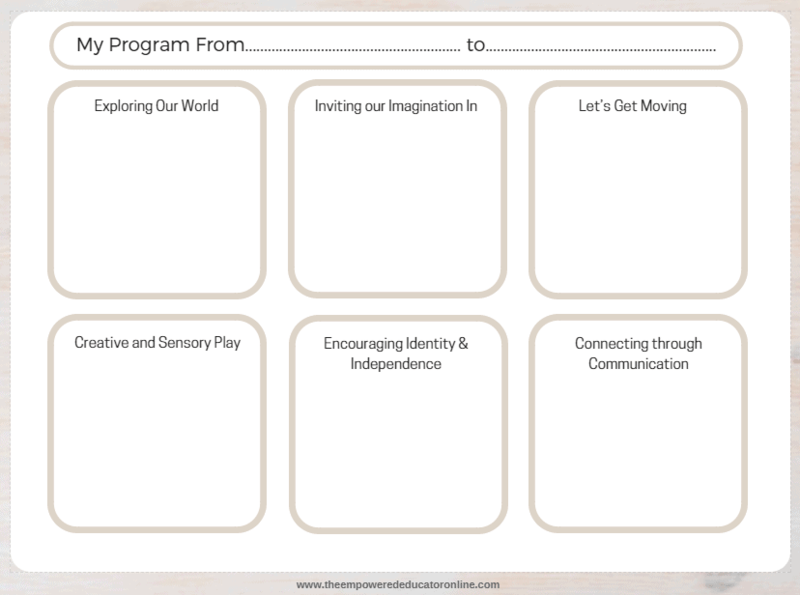 Documenting in Home/Family Day Care Part 2 – Finding your programming style. « Easy DIY Toddler Shakers – Sustainable Fine Motor Fun! Thanks, that was really good. I’ve always felt it was hard to pigeonhole observations into one learning outcome – there’s a lot of overlap within the outcomes as well. As I commented after another post however it still seems like a lot of work – do you get some time during the day for paperwork or do you basically have to do it after hours, like me (what little I do!)? Just looking for activities to plan that I can relate to some of my obs takes a lot of time. I enjoyed reading this! But, organization is what I am needing! HOW do you organize analyzed and collected data for each child so conclusions can be clearly drawn/assessed? HOW do arrange it for each child so it does not get lost, forgotten, or unused? Do you have a file system for each child? Or, portfolio? Do you have folders for each domain w/ongoing documentation for each child? Help with organizing for 10 plus children so that no gaps or holes can form. I do not have the luxury of software to log & track. Although, I am wondering if I could create something on my computer. ?? Thanks!! it is very amazing..keep it up!! it is a good example and thanks for sharing..!! Thank you..Today,I”m doing experience plan. I did jotting but i still hard to complete my experience plan to my teacher. I really sad about that. Hi Jody, an interesting and informative read. I have been an educator, centre owner, teacher at Tas Tafe (currently in my 15th year) and agree with your post. Each person needs to find what method suits them and their service and be reflecting on the EYLF by capturing each childs learning journey over time. Keeping in mind the purpose and intent to observe. Oh, and yes, I want to assure you and your readers that students studying with TAFE most certainly learn about the developmental milestones, without this they would not know what to observe or understand children’s growing competence. So important 🙂 thanks for continuing to inspire and motivate educators, it’s wonderful to hear from a passionate professional family day care educatots perspective. I always enjoy reading your posts and looking at your learning environments. What information are they asking for, what type of methods can be used ie diary writing, photographs, checklists to find out if they have aquired a skills, have specific interests etc, im so confused. Thank u so much. I read all of the article. You have clearly and simply explain every single thing which are very important as an educator. Specially for the beginners.! I’m a single mother of 3 gorgeous children and am currently studying my diploma and your explanation of observations helped me immensely, thank you!! !